Just for fun, my boyfriend and I visited a few online stores where we can purchase Casual Dinnerware Sets. Even if we weren't really experiencing dinnerware crisis, we thought of adding a set or two just in case a special (or not) occasion would call for it. 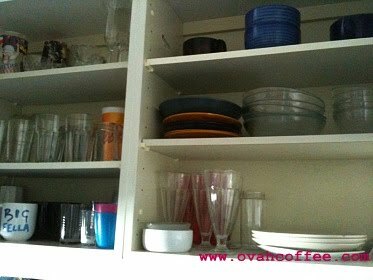 I took a photo of our kitchen cupboard minutes ago (refer to the photo below) and it was enough proof to consider buying some more plates. We have found this 16-piece Corelle Enhancements Dinnerware Set (refer to the photo below), originally priced at $54.99 and is now on sale: $39.99. Each set contains 4 (10 and 1/4") dinner plates, 4 (7 and 1/4") salad/dessert plates, 4 (18-oz.) soup/cereal bowls and 4 cooler glasses. The simplicity of the design attracts me most. The sculptured rim is enough to make the set look classy. The pieces are dishwasher safe and microwaveable. It also comes with a 3 year warranty--- fantastic! 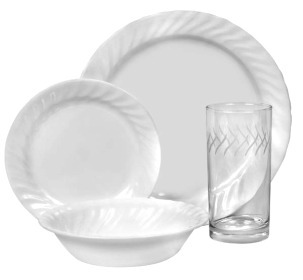 We are thinking of getting two sets of this Corelle collection. It's worth every penny! We have also added two sets of cutlery and two salad bowls to our shopping list. My boyfriend is thinking about buying a set of crystal wineglasses even though we do not really drink. I do believe that it's somehow a good idea if ever we'll be needing such glasses when my boyfriend's family is coming over for dinner. Well, you are doing some serious shopping. I think the Corelle ware is nice, the white makes it versatile enough to go with everything and I agree with you, the sculpted rim does make it look more elegant.